We’re actually launching as we speak, and are refining the message and look/feel of the two sites for RichContent. Thanks to David McInnis of USReliant.com, we flew our freak flag over Seattle, Redmond (Microsoft), Bellevue and along the main traffic routes in the Seattle yesterday. Mike Pinkowski, COO of EZClean Paint Tools took the time to grab some shots of our banner in flight (this is serious banner advertising, folks). 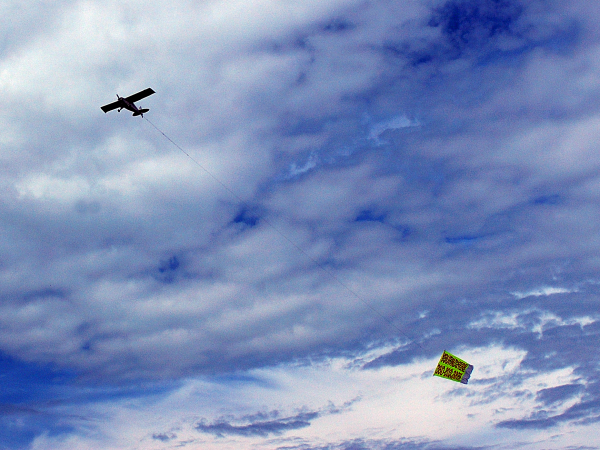 That’s a 100×30′ banner flying behind a Cessna 172. Nice work, thanks to Wayne Adair’s AdsAloft service. We’ll be releasing some interesting stats of how our service performs using ThoughtOffice as a case study. I believe you’ll be pleasantly surprised. Oh, and Chipp Walters in Engineering has some nice surprises coming your way in about a week as well. Look for those in ThoughtOffice as we refine v1.5.1.